Call me crazy, but I had never had spaghetti squash until now. I’m in love now. It’s a delicious way to enjoy your favorite carbs dinner with a vegetable as the noodles! What?!? And they taste like pasta in the great form of angel hair pasta. Mmm! Baking it couldn’t be easier, too. 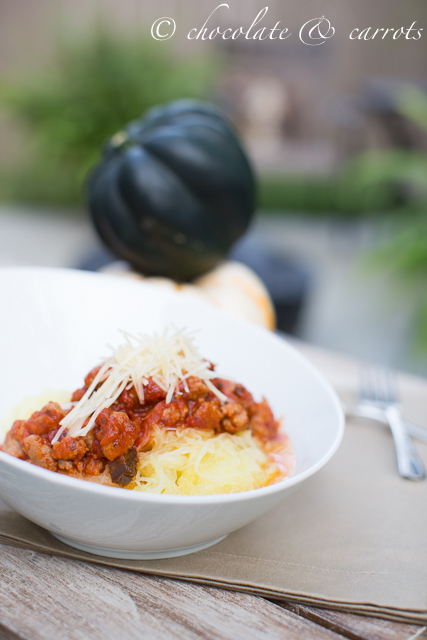 If you haven’t tried spaghetti squash, you should definitely give it a go! Cut the squash in half. In a baking dish, place the halves face down and fill with 1/2 inch of water. Turn the squash face up and bake for another 15 mins or until tender when poked with a fork. Using a fork, gently scrape out the spaghetti squash. Using your hands or a strainer to squeeze out the excess liquid. Serve with your favorite pasta sauce! I have never made a spaghetti squash so thanks for the tips! Mmmm…love spaghetti squash! This looks beautiful! How funny – I just baked spaghetti squash for the first time yesterday! It’s on the menu for dinner tonight, and I’m even more excited to try it after hearing you enjoyed it. P.S. Love the picture you tweeted of your son and dog all bundled up! I had to play “look for the pumpkin”. It’s a little one! That was fun!!! By the way, I love your blog, I love to cook and if I had a digital camera and a computer that wasn’t a dinosaur I think I would try my hand at food blogging. I learn so much every day and have time in my life now for experimenting. I love experimenting with spaghetti squash! 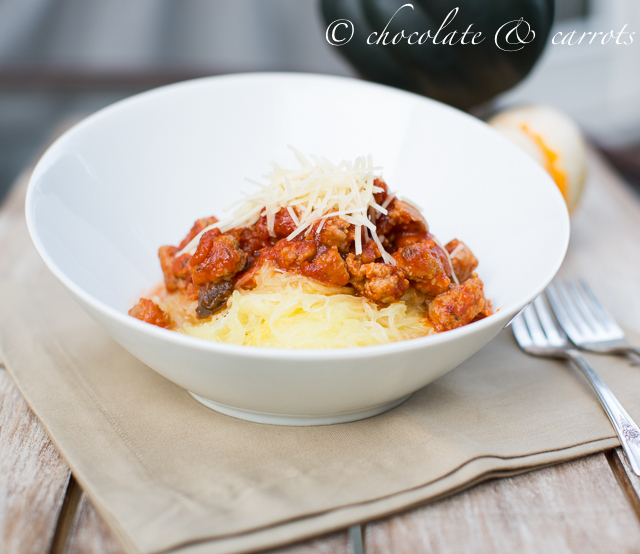 I so love spaghetti squash – the first time I had with sauce I could not believe it wasn’t real pasta noodles! I love spaghetti squash but unfortunately my hubby isn’t a big fan.